The beauty of football is that anything can happen, and that is the way we look at it. I write this feeling insanely positive, and I'm hoping most gunners around the world share that feeling with me. A little more than a week ago, people were talking about Arsenal collapsing and not finishing fourth. Since then, we have shut these people up, wiped the smirks of Spuds players and fans, showed Liverpool how to finish and made it clear that we mean business. I have reason to feel insanely positive. We suffered a heavy defeat at Milan in the first leg, it seemed impossible to turn things around then, but looking at how we have played since, there seems to be a small chance that we will turn things around. The manager thinks so, and I'm sure our captain has made it sure that the entire team thinks so too. Everything seems to be going our way, except a little problem with midfielders. Coming to today's game. I really don't know who will start in midfield, maybe just Song and Rosicky and play an extra attacker? Maybe. I don't know who will start, but I do think that Arsenal can score 4 or more goals today. Look at how this team plays when they believe they can win it! Today, the players are under no pressure at all, they know that. It's a tie nobody expects Arsenal to overturn, so the players will have a go at it. They will not play with the 'handbrake' on, as Wenger sometimes puts it. That is why I think Arsenal can win this by a huge margin. At the end of the day, there is hardly any criticism coming the players way, irrespective of the result. Only a lot of praise should we turn this around! Here is what Wenger will be telling the players "Have a go, enjoy yourselves, show them what you are about". And rightly so, today I have no doubt that the players will play like they own the other team. They will put everything they have at stake to play their own game, something we did not do in Milan. What I think will be very very important, is a strong start, making it clear to Milan, that it's not over yet. Let's look at it this way, the Milan players must have kept an eye on Arsenal in the last 2 weeks. And in the last 2 weeks a lot has gone Arsenal's way. And hence, there will be a seed of doubt in their minds, that maybe it's not over yet. Maybe scoring 4 goals wasn't enough. Should Arsenal get a goal in the first 15 minutes today, this small doubt will enlarge into fear that they are collapsing, and then the Milan players will be all over the place. And the Arsenal players will gain even more belief. Scoring four goals then would not be a problem. Let me spell it out, if Milan think this tie is over, they are wrong, because Arsenal don't think it's over yet, Arsenal are going to have a go at them, and they will be punished for any complacency. 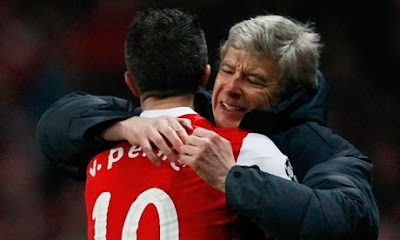 Robin is right, anything can happen in football, Arsenal can score 4 or more goals today. It's all in the mind, Arsenal players know they can turn this around. And if they do, they will go down in history books. The stage is set. They players are up for it, there are going to be 60,000 screaming Arsenal fans at The Emirates making the London tube tremble, and there is no pressure on the players. Look at this from a broader perspective, everything seems perfect. Arsenal just need a good start, should we get that, wait and watch how easily we will keep scoring. We are in for a great great match. This team seems to want it, and that is all that matters. Keep the faith, that is what will keep this team going, and maybe put their names down in history. There are two ways to look at today's game, either, we lost the tie in Milan. Or, are we on the brink of history? Think about it.